Mr Thompson says feedback from forest owners has been enthusiastic in support of renewing the order. “We’ve run meetings and conducted a formal survey of farm foresters’ opinions on how they regard the investment we’ve put mostly into forest research, but also harvest mechanisation, safety, industry recruitment, forest health and biosecurity,” he said. Mr Thompson says he is well aware of recent lack of support in other industries for a levy. “For our part, we’ve worked hard to make sure potential levy payers know how the levy money has worked to benefit them,” he said. “We’ve been transparent and gone to great lengths to get the message out there. We even broadcast a 10-week television series to inform farm foresters of the levy work progress. Mr Thompson said that foresters need to know that not only is the levy invested in ways to help secure higher returns and lower costs at harvest, but that the levy is often paired up with government or other investment. He said the recently announced partnership of levy funds with government support is a NZ$29 million example. 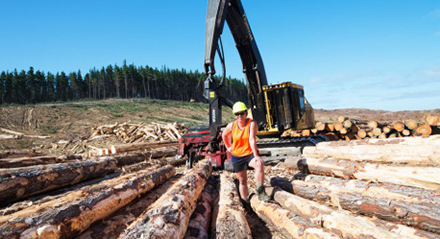 Te Mahi Ngahere i te Ao Hurihuri – Forestry Work in the Modern Age Partnership is a project to bring automation and robot technology into tree felling and log handling, which anticipates saving harvest and transport supply chain costs by nearly NZ$10 a tonne by 2030. “This is a hugely important project which will benefit small scale woodlot owners by offsetting the size of their forests by clever use of technology. I would hate to see such development in our industry jeopardised by a small turnout of voters,” Mr Thompson said. Eligibility to vote is restricted to anyone who owns at least four hectares of trees planted at least 10 years ago. This restriction is because those who would be paying the levy are the ones who have the right to vote for it. “The voter needs to have trees old enough to mature for harvest sometime in the next six years of the new levy order,” Mr Thompson said.